My friend Matt Christensen is really funny. And sweet. And creative. Which is why he started a little project called Excuse Me, I Think You Dropped This. 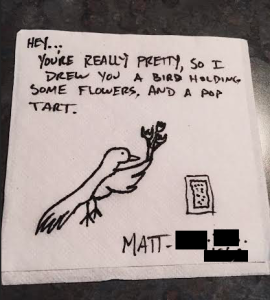 See, Matt doesn’t have the best “game” when it comes to flirting with girls he likes. But what he does have are some not-actually-that-bad drawing skills. So every time he saw a girl he thought was pretty, instead of getting up the nerve to talk to them, he got a pen and drew them a picture. On notebook paper, on napkins, whatever he had handy. Then he’d tap the girl he liked on the shoulder and say, “Excuse me, I think you dropped this…” and see what happened. 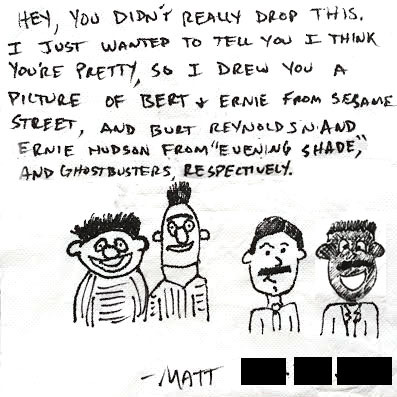 Over the years, Matt has handed out notes from Grand Central station in New York to bars in Downtown Cleveland. And he’s noted what’s come of each and every approach with the girls. Unluckily for him, not much has ever come from this pickup trick. But luckily for us, he snapped photos of his funny drawings before he handed them off, which he’s been posting on his Excuse Me, I Think You Dropped This Tumblr. 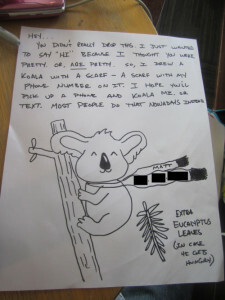 And while it may not have earned him any dates to date, every time I see a new note he posts, it makes me smile. He’s an optimist of the sweetest kind, who is presenting a true picture (literally) of who he really is. I think you’ll get a kick out of it if you check it out, too.